Virgin Trains is overhauling its website to convey the brand's new positioning of train travel as superior to other modes of transport. But ironically it is actually positioning itself as identical to any other mode of transport. As nice as the 'new' website is, to the customer it will look exactly like almost every other corporate website. A shame really. 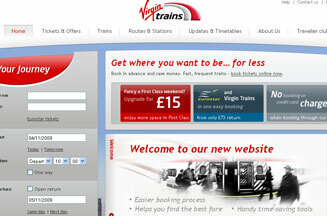 I thought that Virgin would really push the boat out and do something a bit radical, like TPE's relatively new site. Supporting Virgin Trains' re-launch this summer with a campaign by MCBD and Elvis, the revamped site launches on 11 November. It aims to position Virgin Trains as facilitator of ‘personal journeys' and its new Virgin High Frequency service. The overhauled website, by Elvis, includes new features such as an interactive route map linked to station information, a tool that generates custom timetables and a news blog section. It also encompasses over 100 new images which champion the brand experience. Website functionality has also been enhanced to work in conjunction with National Rail Enquiries, The Trainline and Eurostar.